What do our users think of RUDDER? Below are some testimonials from those who use the solution on a daily basis. Hosting & Managed Services There are many reasons why we have chosen RUDDER to help us achieve excellence in service quality. First of all, being able to dynamically create and update groups of machines based on their inventory allows us to transform installation and maintenance procedures into rules that are easy to set up and maintain. The intuitive interface allows us to quickly validate the compliance of these rules over time across our entire IT system. When changes are required, multi-person workflow and double validation ensure controlled production deployment. 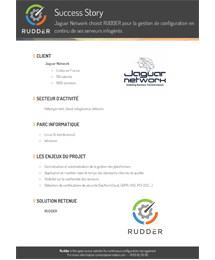 Thanks to RUDDER, our outsourcing service now creates more value for the company because the results of their work are standardized, accessible to all, documented, and therefore reusable throughout the information system. 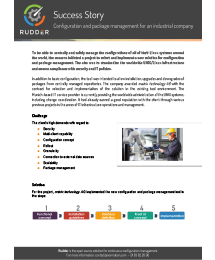 We can also prove to our customers the work done on their systems through the PDF compliance reports provided by RUDDER. Encrypted access systems My objective was to check the conformity and reproducibility of the installation of more than 500 production servers. RUDDER has by far the lowest learning curve among configuration management tools on the market. Once the server is deployed, installing and connecting agents is child's play. Where other tools require you to learn implemented DSLs, new functional languages or specific YAML syntaxes, RUDDER allows you to create your business rules in a very graphical way, to which your entire team can adapt very quickly and easily. Graphical reporting allows you to quickly access the compliance of your entire infrastructure. The integrated inventory can easily be queried from the API to connect to other internal tools - a major advantage when integrating third-party enterprise tools. Digital Television and IoT I was looking for a visualization tool to check the conformity of the servers. RUDDER was the only one to have a complete dashboard with a simple drag and drop editing configuration system. One of RUDDER's strong points is its ease of installation and ease of use, thanks in particular to a set of basic configurations included. The Audit mode is RUDDER's exclusive and most striking feature, allowing you to know the drift of your configurations without touching the existing ones. The API is also useful if you want to connect RUDDER to another tool (such as Ansible to perform certain tasks). Florian H. IT Infrastrcture & Security Consultant RUDDER allowed me to break down the communication barriers I faced on a daily basis. Indeed, generally speaking, in IT, the same subject is divided into two parts: on the one hand, the concrete technical problems to be solved, and on the other hand, the need to satisfy the needs of management around these problems (KPIs, reporting, etc.). Usually, these two aspects of the same subject are hermetically sealed off. At worst they hinder each other in achieving their objectives; at best solving one does not bring anything to the other. With RUDDER, I can easily offer non-administrators a complete and detailed understanding of what works (or not) and what we need to do. Project managers, management and beginners can finally understand what is happening at the same time as technical issues are being addressed. Hosting & Managed Services RUDDER's greatest added value is the concept of continuous compliance. Through detailed dashboards and reports, RUDDER ensures the continuous application of our configurations to all our resources. Besides the main features, the REST API is also very useful to connect RUDDER with third party tools. Finally, the team behind this project is great! Our users speak at conferences to tell their experience with RUDDER, the reasons for their choice, the issues addressed and the benefits obtained. Check also our more detailed success stories. It’s time to know if RUDDER is the solution you’re looking for! 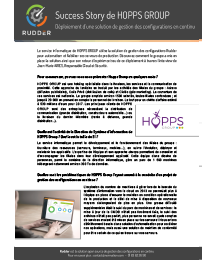 By videoconference or directly at your premises if you prefer (only in Île-de-France), a member of the RUDDER team will give you a free personalized demo of the software according to the issues you are looking to solve and answer all your questions. Don’t miss the chance! Until the demonstration takes place, explore the interface by yourself to generate potential new questions. Download RUDDER directly or visit the online overview.